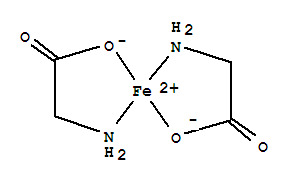 This chemical is called Ferrous bisglycinate, and it's also named as Bisglycino-iron(II) chelate. With the molecular formula of C4H8FeN2O4, its molecular weight is 203.96. The CAS registry number of this chemical is 20150-34-9. Physical properties about Ferrous bisglycinate are: (1)ACD/LogP: -1.03; (2)# of Rule of 5 Violations: 0; (3)ACD/LogD (pH 5.5): -4; (4)ACD/LogD (pH 7.4): -4; (5)ACD/BCF (pH 5.5): 1; (6)ACD/BCF (pH 7.4): 1; (7)ACD/KOC (pH 5.5): 1; (8)ACD/KOC (pH 7.4): 1; (9)#H bond acceptors: 3; (10)#H bond donors: 3; (11)#Freely Rotating Bonds: 2; (12)Polar Surface Area: 40.54 Å2; (13)Flash Point: 99.5 °C; (14)Enthalpy of Vaporization: 52.63 kJ/mol; (15)Boiling Point: 240.9 °C at 760 mmHg; (16)Vapour Pressure: 0.0123 mmHg at 25°C.